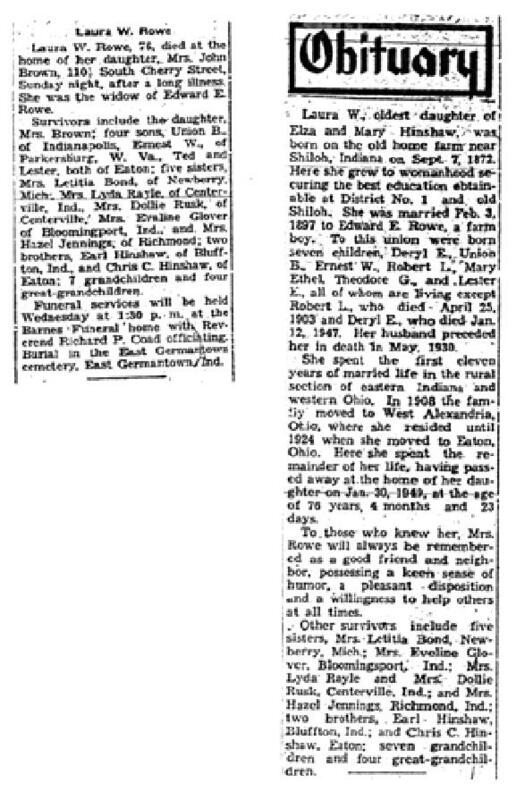 Deryl Edward Rowe, born Oct 26 1897; died Jan 12 1947; married Gail Pickett, Jun 6 1925. Union B. Rowe, born Mar 4 1899; died Sep 9 1965; married Jennie Duvall, Feb 8 1919. Earnest/Ernest Wayne Rowe, born Oct 20 1900; married Lydia --. Robert L. Rowe, born Dec 12 1902; died Apr 25 1903. Mary Ethel Rowe, born Jan 6 1905; married John Brower/Brown, about Nov 17 1946. Theodore Gilmore "Ted" Rowe, born Jan 1 1908; died Jul 20 1976. Lester Ellsworth Rowe, born Jul 24 1910; married Estella Cohee Smith. "Laura, oldest daughter of Elza and Mary E, Hinshaw, was born on the old home farm near Shilo on Sept 7, 1872. Here she grew to womanhood, securing the best education that was obtainable at District No.1 and old Shiloh. She married Feb. 3, 1897 to Edward E. Rowe, a farmer boy of Darke County, Ohio. They had born to them seven children: Deryl E., Union B., Ernest W., Robert L., Mary Ethel, Theodore G. and Lester E. All living except Robert L. who died April 25, 1903. To Laura is due the credit for the raising of a fine family."